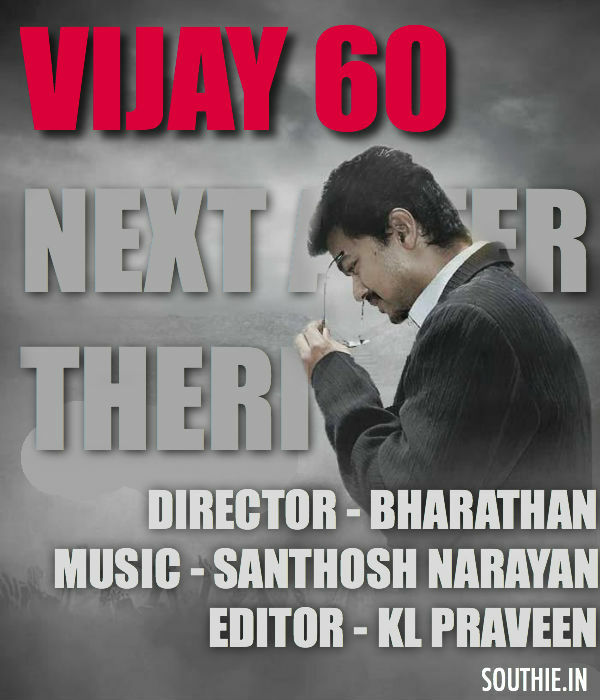 Vijay 60 next movie after Theri with Director Bharathan. Home/NEWS/Vijay 60 next movie after Theri with Director Bharathan. Vijay 60 next movie after Theri with Director Bharathan. Vijay 60 is the next movie of Vijay after Theri, Vijay will be romancing Keerthy Suresh for the First time. Bharathan has been confirmed as the director for Vijay’s next movie after his stint in Theri, Atlee directorial. The Heroine of the movie is still to be finalised and the movie would go to shoot in April 2016. Keerthy Suresh is finalised as the heroine of the movie. Vijay 60 is expected to a be mass masala commercial entertainer. Bharathan has signed fast-growing musician Santhosh Narayanan to compose the music for the film, which is currently called “Vijay 60”. The director has high hopes on his ability and has given an opportunity, say reports. This is the second big project Santhosh Narayanan has bagged after Rajinikanth’s “Kabali”. Meanwhile, Bharathan has roped in Madhie to handle cinematography and signed Praveen K L to edit the flick.